Besides 14 August, 15 August was also an unforgotten day for the people of sub continent. Indians got independence on 15 August 1947 from British Empire; only a day later when Pakistan had gotten independence. So, people of India celebrate this day with total enthusiasm and passion through independence day ceremonies. 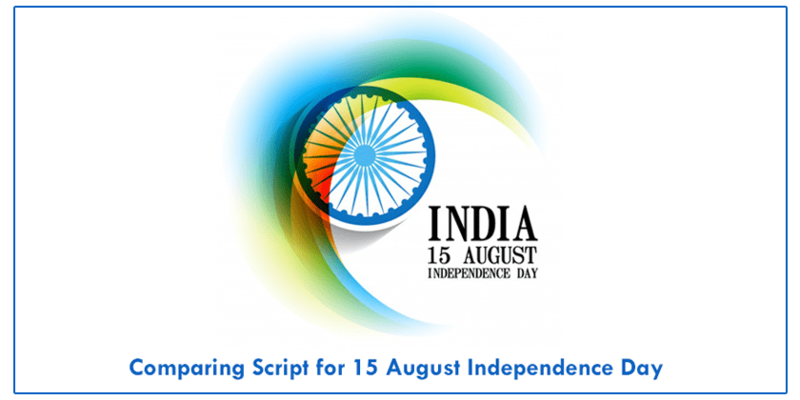 Therefore, this time I have brought you comparing script for 15 August Independence Day to host at your school or college ceremony. To start the function or ceremony, you can say any quote or read any poem. Jushan e Azadi Mubarak Ho! The upright principle, respectable guests, high minded teachers, kind hearted parents and dear shining fellows. Today is 15 August the 70th birth date of our beloved motherland, and we all have gathered here to celebrate this day and to remind ourselves of our duties and responsibilities and our ancestors’ sacrifices. Therefore, I (Name of the anchor 1) and I (Name of the anchor 2) warmly welcome you all to our today’s auspicious gathering on behalf of our entire school family. A highly warm welcome to our respectable chief guest (Name of the person with a small introduction). Without taking much of your time, let’s start out function by a patriotic music dance by our little fairies to welcome you all once again for this spectacular day. So, put your hands together for the little angles. This was indeed an outstanding performance; therefore they need to be appreciated. So, a round of applause for them, please. Yes, now it is time to remind us of some of the moments that belong to 1947 and before that is revealed as the era of struggle and sacrifices for all the people of sub continent. 14 August the day when Pakistan got its independence and 15 August when India came into being after many efforts and countless sacrifices. To highlight some of those moments of sacrifices, we would like to call (Name of the speaker) on the stage to take us back to that era. So, put your hands together for him. For the blink of an eye, let us also create this stage a stage for drama, performance and the world of dreams. So, put your hands together for (Name of the performer and group). Anchor 1: Undoubtedly, a soulful performance! Anchor 2: Yes, for sure. Now, it’s time to listen to our honorable chief guest the man with a huge heart. Round of applause for him, please. Thank you, sir, for your precious words! Now, to present the 1947s struggle through play, we want to call (Name of the group of performers). Appreciate them, please. Outstanding! And we do hope you all are having fun. To bring some refreshment, let us ask you some general knowledge questions to see how well our students know about our homeland. Now, we would like to call upon the stage the person who is an inspiration for most of us, the man who is the secret of the success of our Institute; to say a few words on this special occasion. Both the anchors: Thank you, sir. Unfortunately, at the end of the day, we need to say good bye no matter we don’t want to. Yes, it is time to end this awesome day and say good bye. But before that, we both from the core of our hearts want to wish you all a very happy 15 August.